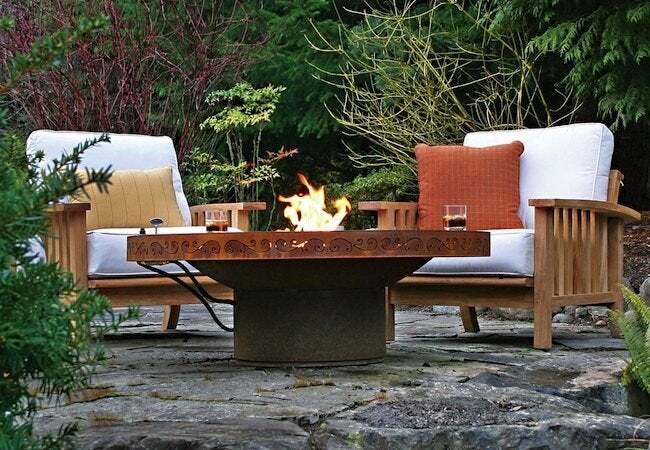 Fire pits vary widely in design and sophistication, running the gamut from a simple hole in the ground to sculptural, push-button units involving no wood whatsoever. Read on for details on the myriad options on the market today. A fire pit introduces a festive yet intimate feeling to any outdoor living area, and perhaps best of all, there are countless appealing designs that are readily available. That said, you may not want to choose a fire pit based only on looks. There are a range of different fuel types to consider, each featuring its own set of pros and cons. A traditional wood-burning fire pits produces the most heat and therefore can double as an outdoor grill, if desired. The downside is that seasoned hardwood can be pricey and to remain usable in the near term, it must be stored out of the rain. Also, wood-burning fire pits generate smoke and sparks, and while you may have assumed that any fire pit would do so, that’s no longer the case. Natural gas fire pits light up instantaneously, at the push of a button, and they are smokeless. However, because they require a gas line, such units are not portable. Also, depending on how you intend to use your fire pit, it’s worth noting that gas models produce less heat than their wood-burning cousins. A third option is propane, which offers the convenience and smokeless operation of natural gas, but with the important exception that, since the fuel comes in small tank, propane pits are easy to move. You must refill the tank, of course, when it runs out, and to some homeowners, the tanks themselves are not so nice to look at. Clean-burning ethanol gel fire pits are the most environmentally friendly choice, but they are also the most expensive. Also, since ethanol gel fire pits deliver the lowest heat output of all, meaning that for any purpose other than creating a glowing ambiance, you’re better off with another type. No matter which type of fire pit you favor, be sure to check local fire ordinances before purchasing and using your choice.